The other day, in a chat with several someones, I stated, “Artists are not interested in games.” As with any blanket statement it cannot be entirely true. Upon reconsideration I think it’s more accurate to say “Artists are not interested in the games industry.” For that is something that will drive all but the most iron-stomached away. I do think many artists can see video games as a worthwhile medium… just not many of them do. Someone mentioned to me last week, as an example of an artist made game, this work by Mel Chin called KNOWMAD in which one must navigate roads contrived from patterns found in Turkish carpets. I believe the ultimate prize is to find a promegranate. ART:21: How did “KNOWMAD” evolve? CHIN: I was interested in the maps that are not written down but created in the mind. And where do they occur? In contemporary culture, they occur with eleven year-olds, ten year-olds, playing video games and winning or getting the prizes or whatever they do, slashing or slaying the beast. And they memorize their path because that’s the one way—it’s the start of memory—and that intrigued me. How can we create this kind of mapping? I’ve been interested in arcade games and in all these things, not necessarily as a player, and not necessarily as one who participates in that, but as it has a profound effect on culture. How do ideas survive in culture? Not necessarily my ideas or anybody’s ideas, but how do ideas stay around long enough to have a conversation? From a conceptual standpoint, I’m interested in that. And knowing that video games probably equal or better Hollywood in their volume of intake of money shows you how much influence it have in the world. And then where is the art? Where is the cultural aspect involved with it? Last week, when we were asked in a room full of people if there were any progenitors to what we are doing, we didn’t have an answer. I believe we simply shook our heads and said sheepishly “No, there is no one doing what we are doing… There has never been anyone doing what we are doing.” Well, not in the way we are doing it. Put over-simply, some sort of art and video game hybrid with more emphasis on the art than the game. Again, not _exactly right. Difficult being put on the spot on a subject like that. We were taken aside after the talk by a performance artist/gamer who told us we need to know about Kenji Eno and his WARP development studio. Apparently we also needed to have a look at D, Enemy Zero, and D2. Sega Saturn and Dreamcast games… youtube will have to do. Kenji Eno: I want to go back a little bit and explain a little. Originally, I was an observer more than a game creator, like someone who was looking at the game industry from the outside. That’s why I had all of these different, crazy ideas — like creating a game without visuals. I had all of these kinds of ideas because I was seeing the game industry from the outside. But around the time of D2, I felt like I was getting too close to the inside; I felt like I was turning into a normal game creator. Before, I was more like a producer, trying to look at everything from the outside, you know, like, “This might be fun, this might be interesting, and it might make an impact on people.” And I didn’t like going to any game-related gatherings or anything like that because I was trying to distance myself from it. D2 was a fun game, and the story was crazy and all that, but I still think that it’s a normal game, and I was noticing that it was a normal game. So I wanted to distance myself again so I could be the person outside of game industry so I would be able to create fresh games again. So the reason I stopped creating games was because I wanted to create games again from the outside. and this history lesson from GameSetWatch. Hard to tell from video, of course, but in every case, cutscenes seem to dominate them. Maybe it was just how things were done then. Enemy Zero looks particularly promising, a game wher eyou must fight/avaoid an en enemy you cannot see, only hear. Aside from all the unfortunate first-person shooteriness there is a soundtrack by Michael Nyman(!) and animations by *gasp* Fumito Ueda. * “Doesn’t matter if it is a game or not so long as you enjoy it.” Tattoo it on your inner eyelids kids. * Interactive art and games have plenty of overlapping concerns. * Video games differentiate themselves from traditional games (chess, go, hide & seek etc.) by virtue of what they can offer that traditional games cannot. immersion, interaction with a virtual system, networks, realtime/alt-time/non-time (non-linearity etc. ), multimedia. “Body Paint” Installation at “Clicks or Mortar”, March 2009 from Memo Akten on Vimeo. Author AurieaPosted on July 31, 2009 Categories SensesTags Senses1 Comment on Take that, Project Natal! 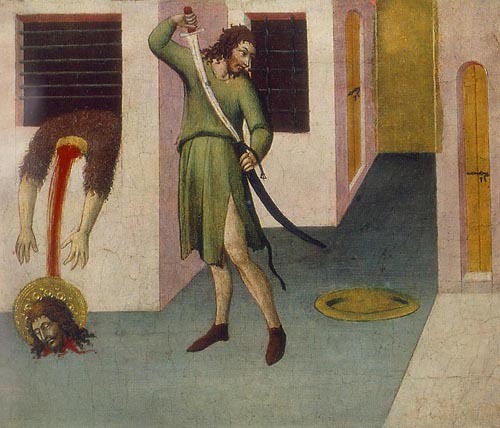 15th Century Italian painting of John the Baptist’s beheading. By Pietro di Sano. This picture makes John’s execution almost look like an unfortunate accident. Somehow sticking his head through the window -was he trying to escape?- led to a lethal injury. If course that’s if we ignore the man in the middle with the perfectly clean sword. A scimitar, no less, indicating the exotic origins of this person -despite of the Roman regime that had decided on the prophet’s fate. He’s looking at the golden platter. His job is not done yet. I wonder if he’s thinking about how he’s going to fit John’s aureole on that thing. It too looks like it’s made of solid gold. Is that why his head fell off? From the weight of his holiness? Or did it have a sharp edge perhaps? This would certainly explain the cleanliness of the scimitar. John was wearing his typical outfit of camel’s hair (as described in the Bible by Matthew), often interpreted by medieval artists as camel skin. But in all likelihood, he probably wore woven clothing. And a camel’s hair is probably very rough, indicating a certain inclination towards masochism in the prophet, not atypical for Christian martyrs. A much more dignified depiction of the saint comes from Jan van Eyck, painted a bit earlier in the same century. 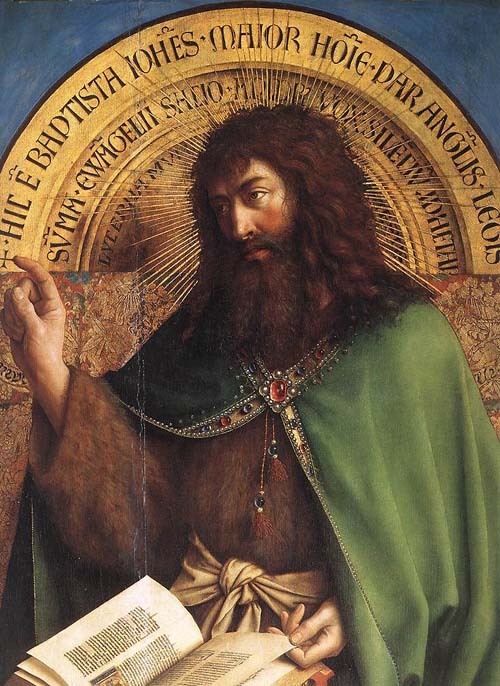 Detail of the 15th century Flemish Alter Piece depicting John the Baptist. Painted by Jan van Eyck. Judging by the rich cape that covers his camel skin dress, this is probably a portrayal of John the Baptist after his death, in heaven. Looks like Salomé didn’t get to keep the head, after all. And now it is even surrounded by a magnificent aureole of golden rays. To think that this amazing piece of work is only one part of a much larger, much more complex and breathtakingly marvelous piece that is located at 10 minutes walking from my door! In Saint-Bavo’s Cathedral in Ghent. Who needs death when heaven is so nearby? The picture of John the Baptist apparently got stolen together with the panel of The Just Judges. The latter was never recuperated, which is a shame. But I hate how this stupid so called mystery of the lost panel overshadows the splendor of the masterpiece. I mean: it’s got a lamb on a table with blood coming out of its chest!!! Saint-Bavo’s Cathedral, by the way, is probably the one work of art that has influenced our own practice most. Not just the altar piece, but the entire cathedral, from its gothic architecture and its dramatic staging of baroque decorations to all the paintings and sculptures in it, ranging from the sublime to the banal. In this cathedral we started thinking about non-linear storytelling in three dimensional space. Heather Chaplin has interviewed us and made a piece about The Path for “All Things Considered” on NPR. It’s running today at 4:50 East Coast Time. An MP3 version of the piece can be downloaded here. 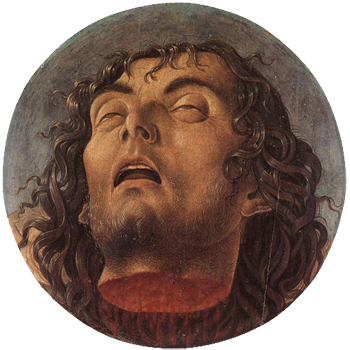 A 15th century Italian painting of the Head of John the Baptist. Painted by Giovanni Bellini in 1464-1468. This head is very similar to the one Cranach painted almost a century later. That same mix of agony and ecstasy, blood dripping out. Oscar Wilde does a similar thing in his play by turning the full moon into a recurring theme. Moon, platter, neck, head. Aureola. While Auriea is away, visiting family at the other side of the globe, I find myself more interested in improving personal skills than otherwise. I usually don’t care much for challenging myself or developing personal routines when I’m with her. I guess the relationship itself brings enough challenges and routines. Plus any free time spend on my own, doing personal things like learning to play a certain piece on the piano, feels like time away from her. Which is not how I prefer to spend my free time. If I have the choice. But if I don’t have the choice. If I am alone. Then suddenly those options become available. I do think it’s mostly because it takes my mind off of being alone -something which I deal with very badly, Auriea and I having done virtually everything together for the past 10 years. And I find myself thinking of the challenges that players of videogames enjoy so much -and that I often fail to understand or appreciate. Maybe they are similar to learning a piece on the piano: trying to do something for no other reason that being able to. Dedicating yourself to the task of developing the skill. It passes the time and takes your mind off of your life for a while. And your death. And your loneliness. And it makes you feel like you’re improving yourself. Maybe I just don’t understand videogames because I’m happily married. Maybe this is what is keeping games from breaking through as a medium. That most people are. Author MichaelPosted on July 12, 2009 Categories Silly thoughts & daydreams18 Comments on Gaming is for bachelors? A 16th century German painting of Salomé holding a platter with the head of John the Baptist. Painted by Lucas Cranach the Elder in 1530. Notice how both characters are looking at the spectator. Salome is appropriately dressed as a noble woman (though typically anachronistically so). And John is opening his mouth as well as his eyes. In ecstasy? Or to allow his last breath to escape? I guess since his neck is “open”, he might as well open all orifices he has left. The platter seems like an oversized common kitchen plate. I wonder if anyone ever made the association with food when Salome requests the head on a platter. Like the spider eating its mate. And instead of saying “I have kissed thy mouth, Jokanaan”, she’d say “And I will eat you!”. Little Red Ridinghood popping up again? What’s up with that? She is holding him like a lover, not like a dish. And the red of her mouth easily leads the eye to the red on his neck. It’s cute how they look at us. Like a couple caught doing something they didn’t want others to witness. We may have been a bit quiet lately about The Path, but that doesn’t mean that other people don’t talk about it anymore. Most of the time to share their joy and attempt to express why they think The Path is interesting. The only really negative reviews are passionate expressions of hatred and disgust and disapproval that sadly don’t contribute much to anything -apart perhaps from being amusing in their own right, for some. So please forgive us if we skip those. This first quote is actually from a comment on an early review of The Path. But we thought it very poignant. The Path reminds us of how innocent and hopeful most video games are. Look, say, at Doom. Man with shotgun takes on the Devil and destroys Hell. That’s optimism. Unrealistic, but a nice thought to keep you warm at night when things aren’t going well. Real life is a variable experience where you learn things, have some enjoyable experiences, some nasty ones, and then… you die. That’s The Path. The experience of the journey is what The Path is about. What you find in the forest, who you meet, and your girl’s eventual fate intertwine into an experience that’s almost certainly not a game in the classic sense, but does bring to mind the awesome power of interactive experiences in a way many games simply don’t do. There is no doubt that Tale of Tales is showing the gaming world exactly what it needs to see: that there is more to this new medium than what we are familiar with, that video games can be emotionally evocative in their own right, and most importantly that we, as gamers, should expect more from developers than overused conventions. Der Wald kann Spiegel eurer Psyche sein, sofern ihr es zulasst. Es gibt keinen Lösungsweg, keine vorgekauten Richtungen. Ihr selbst seid Teil des Spiels, müsst euch aber darauf einlassen können. O objetivo de cada uma das irmãs não é chegar sã e salva à casa da vovozinha. Na verdade, o que cada uma delas busca é encontrar o seu próprio lobo mau na forma humana. Enfrentar esta tendência pode ser tão denso e visceral que faz com que ser devorada viva pareça um final feliz. What if the wolves you meet are not furry creatures with sharp teeth, but rather metaphoric wolves constructed from your past experiences, fears, and future desires that you need to understand and confront in order to be ready to cross the threshold into grandmother’s house? The music and ambiance of the game is the one that will really mess with you. Not only is it suitably haunting, which leaves you feeling a bit unsettled like something is out there watching you (guess what you’re right! ), but the sound effects that are playing, while random, always seem to be happening right when your nerves are frayed from the music. What if ‘Little Red Riding Hood’ was not simply a cautionary tale, but a metaphor for life instead? A The Path egy olyan bizarr mese, mely teljesen új megvilágításba helyezi gyerekkorunk egyik meghatározó, mindenki által jól ismert, “happy enddel” végződő történetét. Egy metaforikus költemény, melyben mindennek mondandója van, minden utal valamire, amit vagy megért a játékos, vagy nem. Döntéseinknek súlya van, rajtunk áll mikor és mit csinálunk, és hogy mindezt hogyan éljük meg. Iedereen die geïnteresseerd is wat er allemaal mogelijk is met games en de manier waarop men op interactieve wijze verhalen kan vertellen, is het aan zichzelf verplicht dit grimmige sprookje te gaan spelen. The Path, while minimalistic, provides a magical setting in which the player’s mind blooms with imagination as they discover the beauty and terror that encircles the safety of the beaten path. Indie game developer Tale of Tales’ The Path pulls off the virtually impossible: to create a new genre of video games that is not only addictive in its replayability, but more psychologically challenging, haunting, and disturbing than the average horror game, all at a fraction of the developmental cost and manpower of the average title. aybendito on Ay, Bendito… UFF DA! The last article also calls The Path “The Blair Witch Project of video games” which is enormously flattering but sadly incorrect giving the discrepancy between the two in terms sales figures. At least, so far… So don’t stop talking about The Path!